BASRA, Iraq: ran’s ambassador to Iraq opened a new consulate for his country in the southern city of Basra on Tuesday, four days after its old mission building was torched by protesters. Basra has seen a surge in deadly protests in the past week, with demonstrators angry about poor public services setting alight several key buildings. 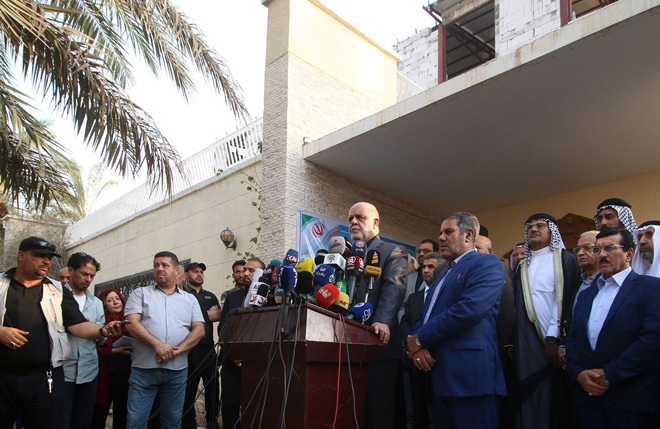 “I’m here to inaugurate the new premises of our Iranian consulate in Basra … because we don’t want lose a single day of services for the people of Basra,” said ambassador Iraj Masjedi. Iran is one of two major powers present in neighbouring Iraq, along with the United States. Many Shiite pilgrims from Iran are expected to travel to Iraq in around 10 days for the Ashura rituals and in October for the Arbaeen commemorations. The Iranian consulate building in Basra was torched by demonstrators on Friday, with its documents and equipment going up in smoke. None of its staff were injured.